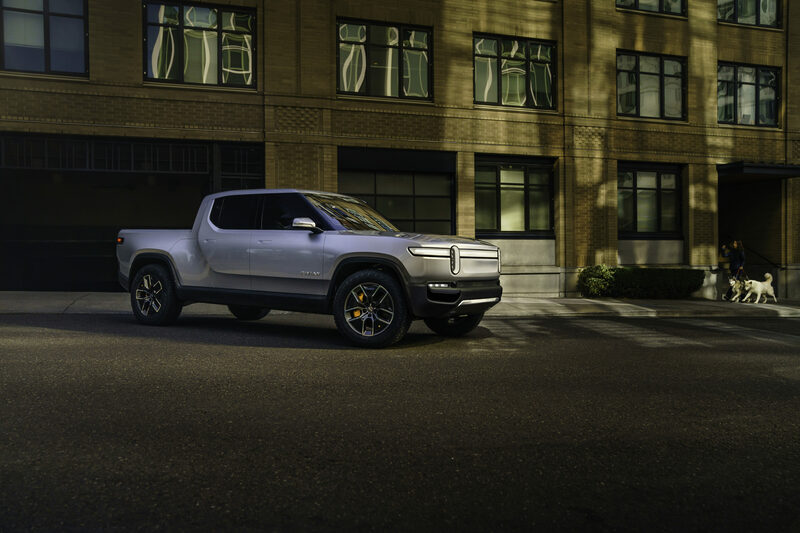 Rivian, an electric vehicle manufacturer, has released information about the first of its two Electric Adventure Vehicles™ the R1T™, an all-electric, 5-passenger pickup. The automaker will introduce its fully electric SUV – the R1S™ along with the R1T to the public on Nov. 27, at AutoMobility LA. 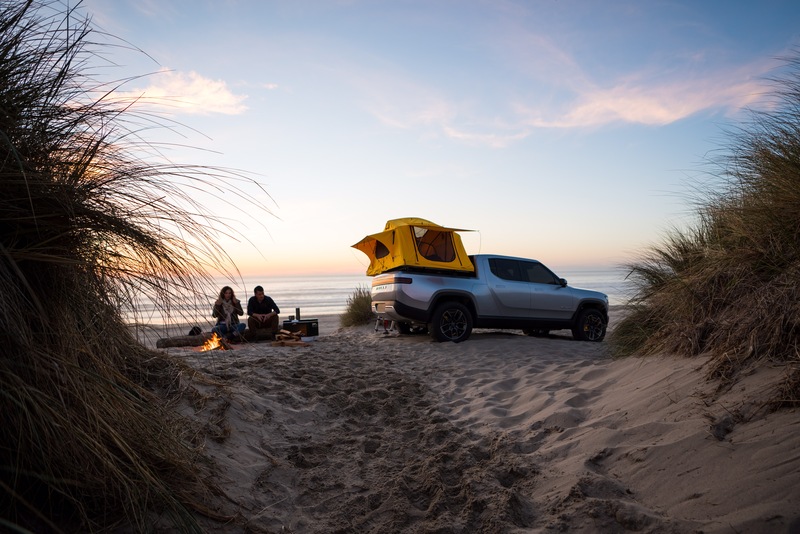 The highly anticipated truck features a range of up to 400+ miles, a wading depth of 1 meter, and the performance and precise control of quad-motor AWD and has been developed to help customers get out and explore the world. 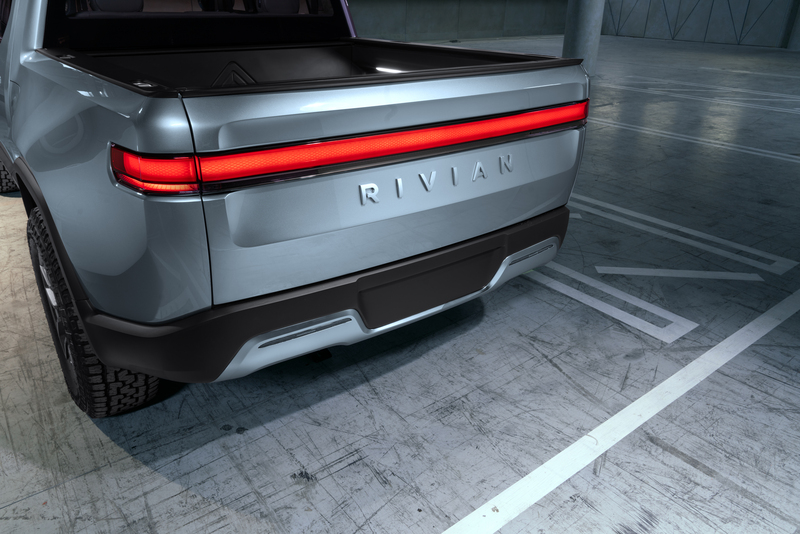 The R1T and R1S will be produced at Rivian’s manufacturing plant in Normal Il, from late 2020. The foundation of the R1T and R1S is Rivian’s skateboard platform, which efficiently packages the battery pack, drive units, suspension, braking and thermal system all below the height of the wheel, leaving the space above for occupants and their gear. Beyond the packaging benefits, this architecture delivers a low center of gravity that supports the vehicle’s agility and stability. Adding to these inertial advantages is a sophisticated suspension architecture with unequal length double wishbone suspension in the front and a multi-link suspension in the rear. The suspension features dynamic roll control and adaptive dampers along with ride-height adjustable air-suspension – allowing the suspension to be adjusted for highway comfort, on-road performance or off-road capability. 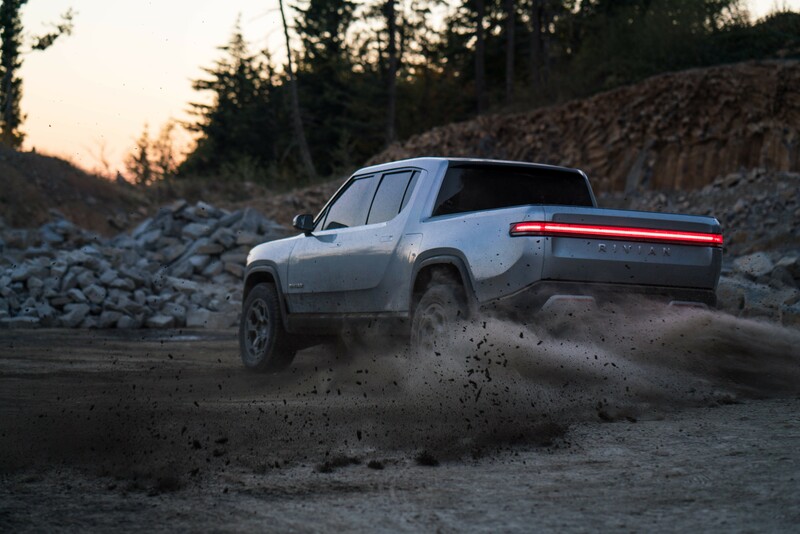 Rivian’s vehicles also feature a quad-motor system that delivers 147kW with precise torque control to each wheel, enabling active torque vectoring and maximum performance in every situation, from high-speed cornering to low-speed rock crawling. With 3,500 Nm of grounded torque per wheel (14,000 Nm of torque for the full vehicle), the R1T can reach 60 mph in 3 seconds and 100 mph in less than 7 seconds. This powertrain and chassis also enable the R1T’s tow rating of 11,000 pounds. “The beauty and elegance of our quad-motor setup isn’t just about brute power; this architecture provides instantaneous torque with extremely precise control at each wheel, which is completely game-changing from a dynamics perspective, both on- and off-road,” said Executive Director of Engineering and Programs Mark Vinnels. Rivian’s vehicles have been designed to communicate strength and refinement while still inviting customers to get them dirty. Strong proportions and clean, continuous bodylines help the vehicles achieve a modern, inviting stance while acknowledging the performance and level of technology integrated into the vehicle. 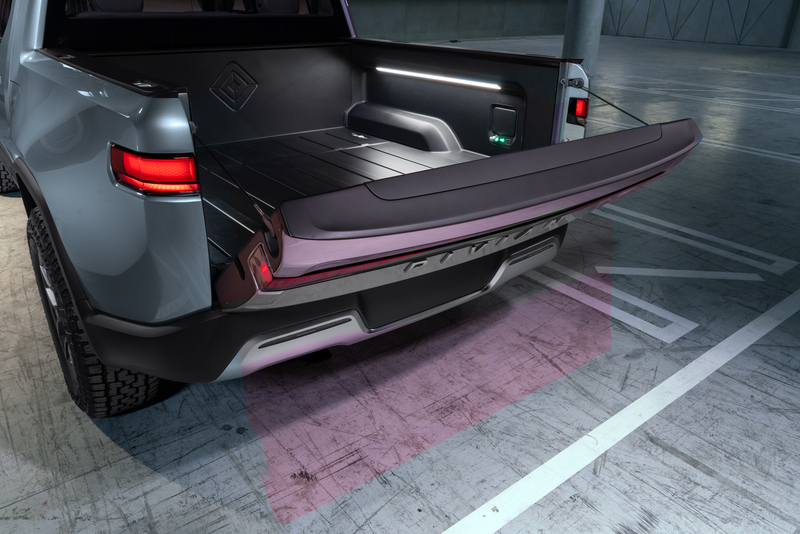 The main bodyline of the R1T wraps up and around the cab and gives the vehicle a distinctive silhouette, while highlighting the Gear Tunnel™ cutline and accentuating the rear fender flares. 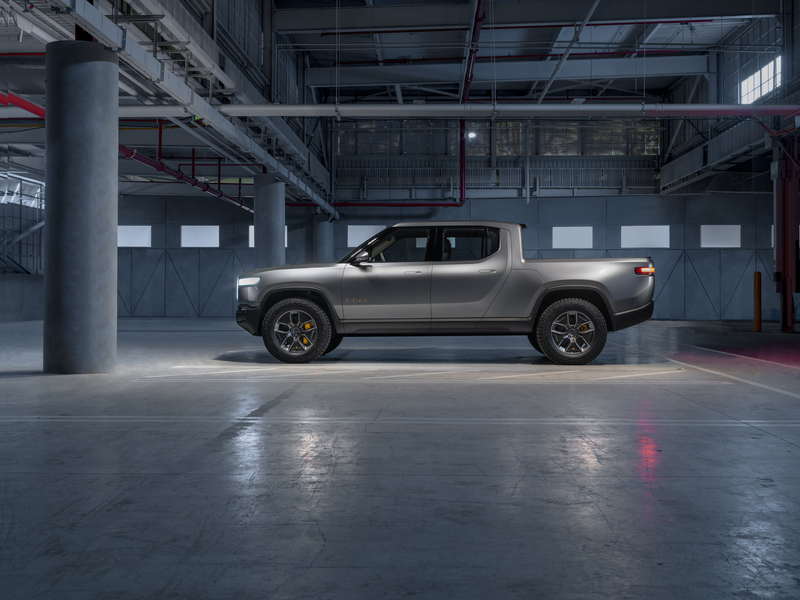 The R1T features short overhangs, high ground clearance and aggressive approach and departure angles for a confident and rugged stance, all enabled by Rivian’s unique skateboard platform. 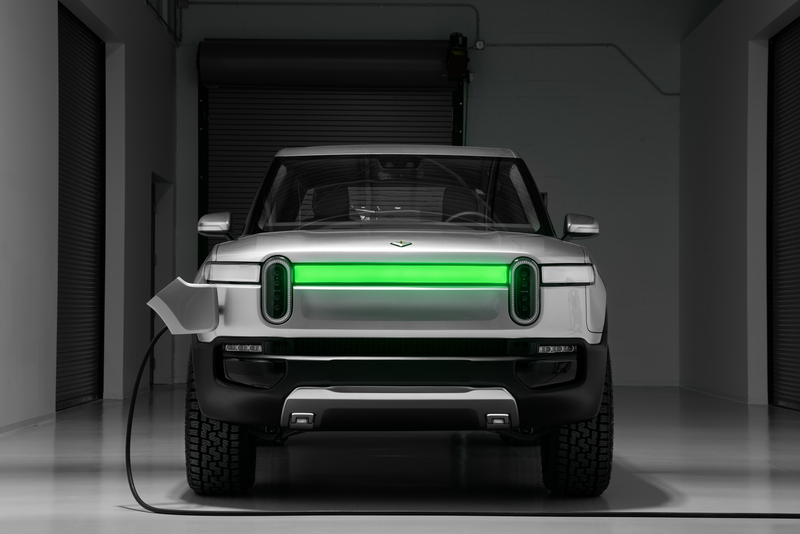 A Rivian will be quickly recognized, with its iconic, signature “stadium” headlights and a daytime running light that extends the entire width of the vehicle. 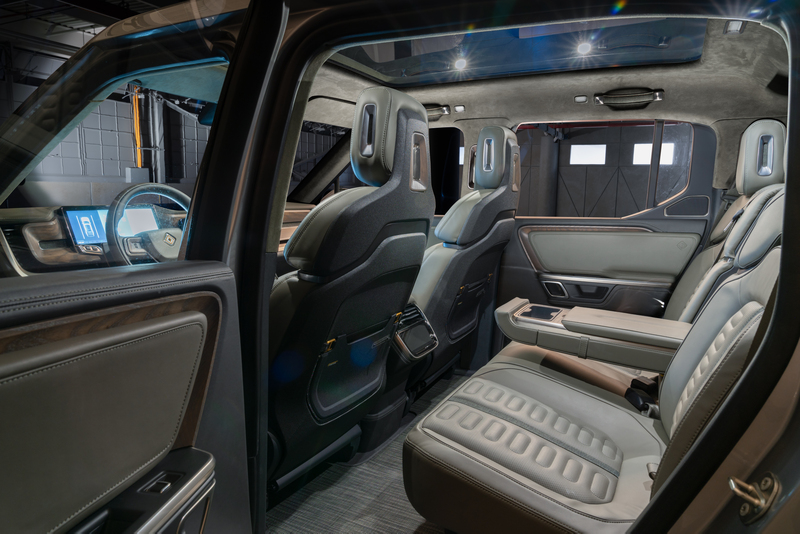 In harmony with the exterior, the interior of Rivian’s vehicles welcomes occupants into a premium environment that conveys craftsmanship yet invites rugged, daily use. 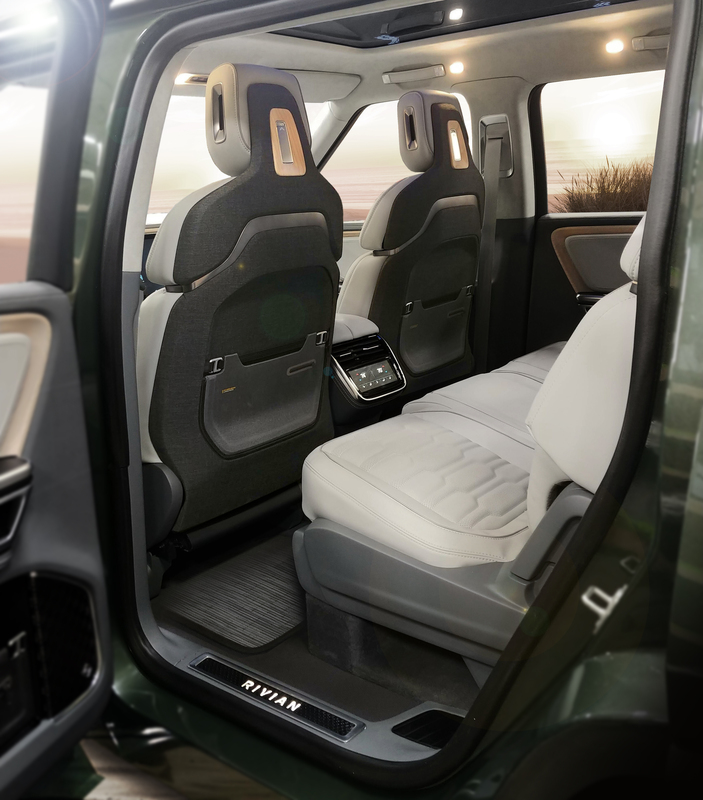 Color and materials play an important role in differentiating Rivian vehicles. Sustainably sourced wood is used throughout the interior and its natural finish contributes to a warm and inviting feel. 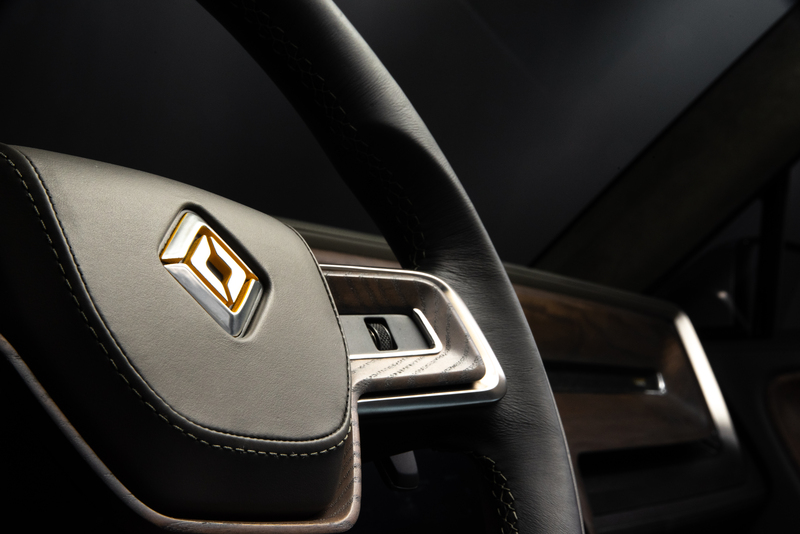 The most striking use of wood is as a structural element in the dash that integrates the main center display and driver cluster, integrating form and function beautifully. 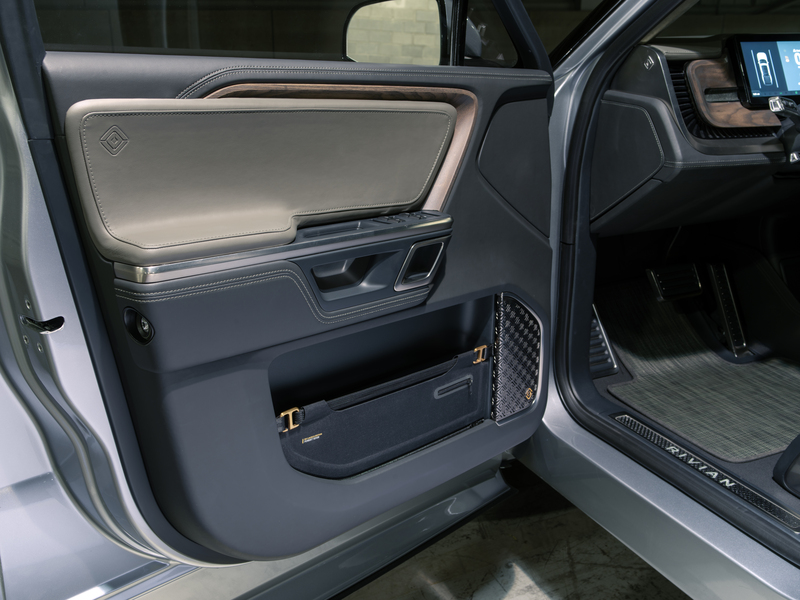 In the high-wear areas of the interior, the materials take inspiration from sportswear and active gear, combining durable and innovative materials that can easily be cleaned. 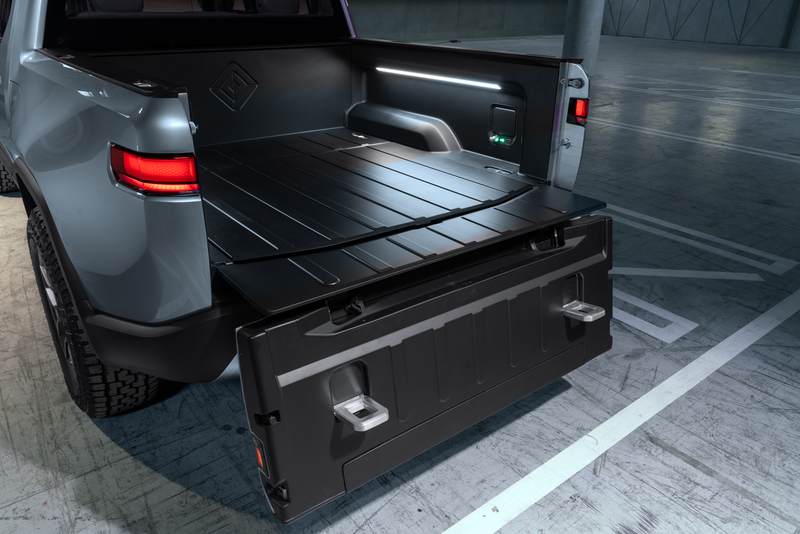 The R1T leverages the vehicle architecture to deliver more lockable storage than any other pickup in the world. 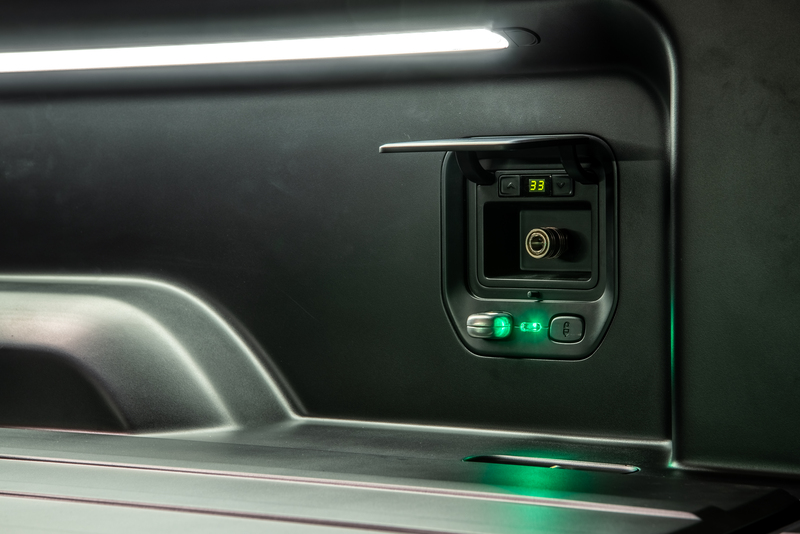 The 330-liter front trunk is easily accessed for daily use with the hood fully powered for opening and closing. 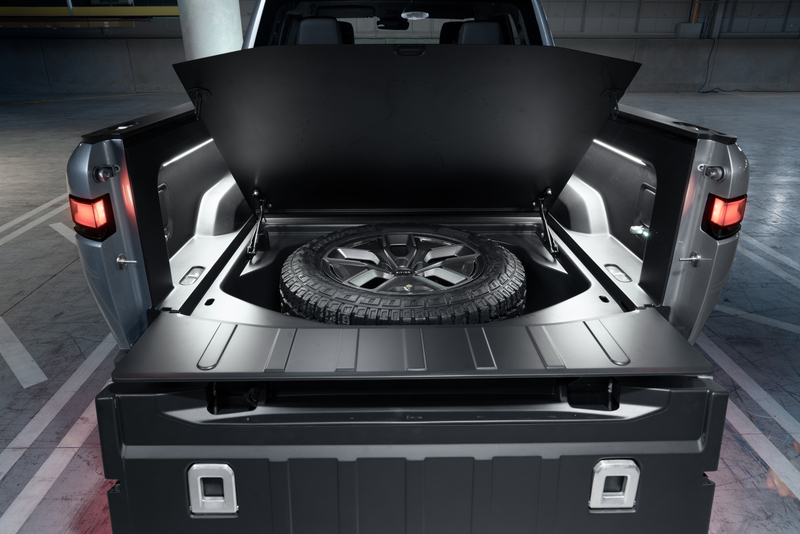 The R1T’s lockable Gear Tunnel sits below the cab, and extends across the width of the vehicle, providing more than 350 liters of space for hauling oversized gear, such as snowboards, golf bags or strollers. 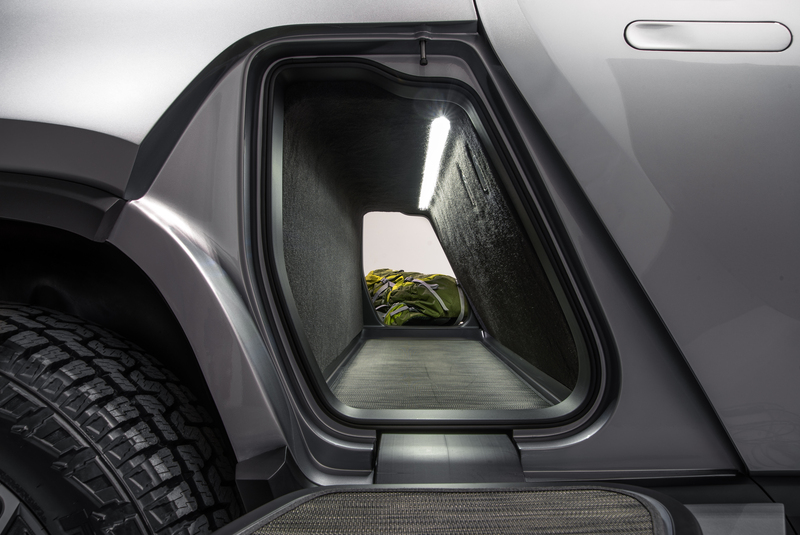 The Gear Tunnel doors also act as steps for loading items into the bed or onto the roof, as well as a seat and a convenience platform for such as lacing up hiking boots. 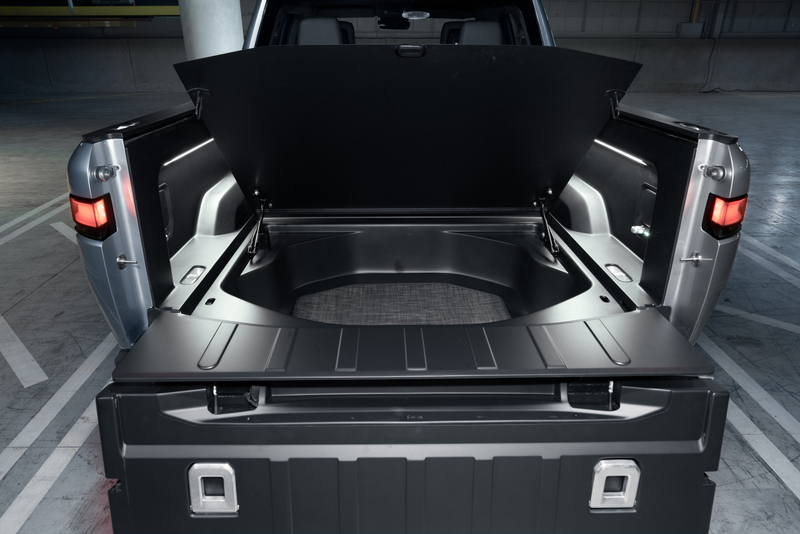 The R1T has a watertight, integrated tonneau cover and beneath the bed floor is a 200-liter sealed bin that can also be used to store a full-size spare tire. The bed features three 110-volt outlets and integrated compressed air. As part of a Gear Guard™ feature, the bed also has two integrated locking cables to safely secure bicycle frames and other gear to the bed. Any gear stored in the bed is monitored by a bed camera and the system alerts owners should the bed or contents be tampered with. 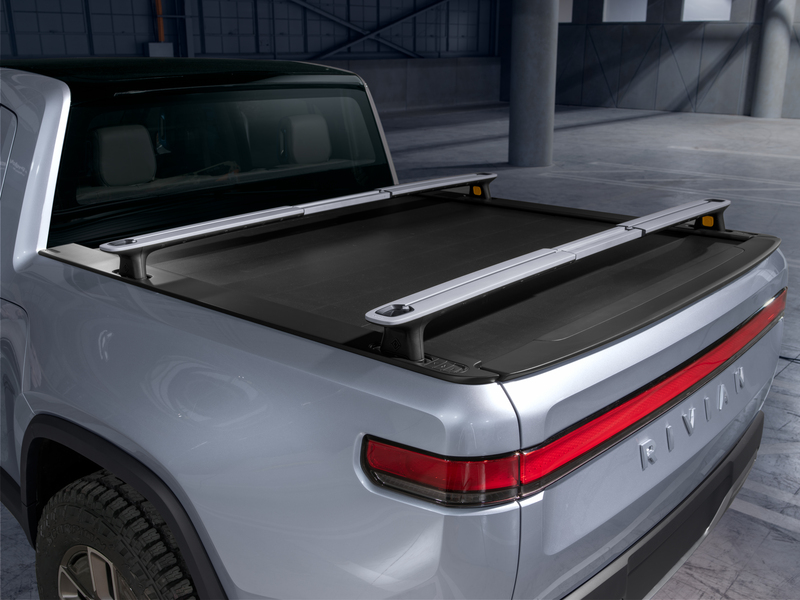 Rivian has developed a telescoping racking system with easy-to-use mounts that quickly attach to the roof as well as the bed rails and bed floor. The racks integrate with a range of accessories including tents, travel containers and bike/ski racks. When not in use, the racks can be easily stored in the front trunk. 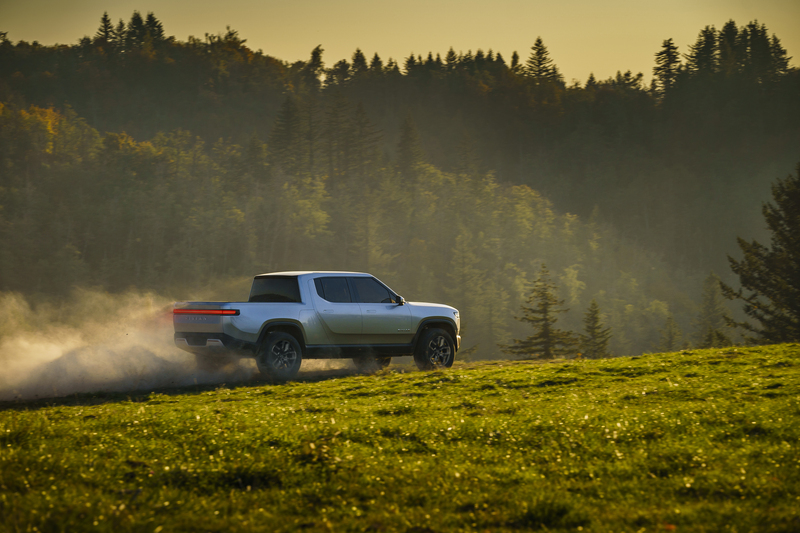 Rivian’s energy-dense battery module and pack were developed with the most demanding journeys in mind — incorporating tough underbody protection and an advanced cooling system to give occupants the confidence to go further, regardless of terrain or temperature. Adaptive control algorithms learn driver behavior, optimizing user-specific battery management for maximizing battery life, reliability and second-life reusability. Three battery sizes are planned, with the 180 kWh and 135 kWh available at launch and a 105 kWh being made available within six months. The battery is designed for fast charging with charging rates of up to 160kW. This enables approximately 200 miles of range to be added in 30 minutes of charging. 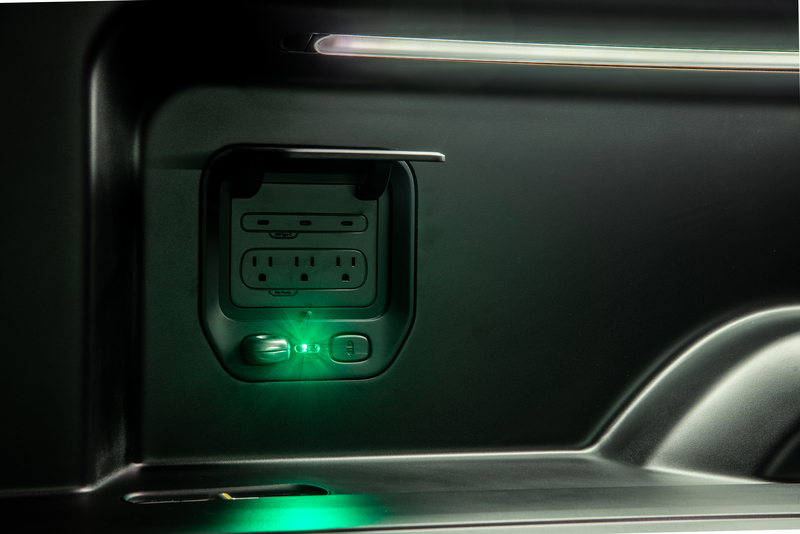 In addition to DC fast-charging, an 11kW onboard charger facilitates rapid charging at a Level 2 charger. 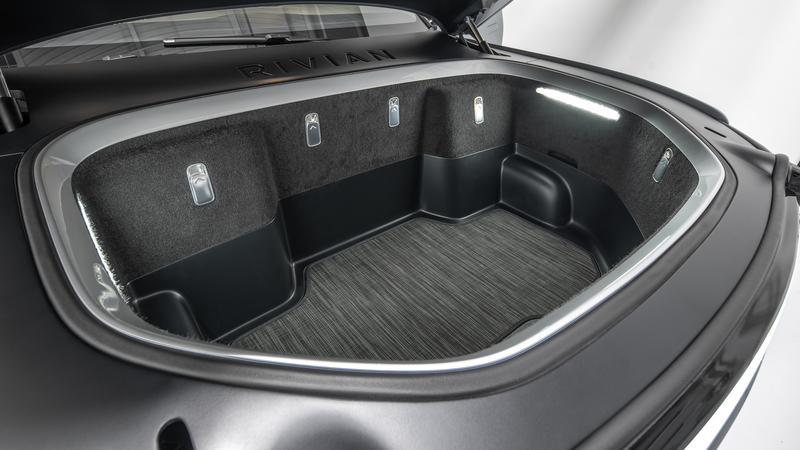 Rivian has developed its connected car platform from a clean sheet to allow full control and flexibility over the vehicle hardware, software and user experience. The system operates on a high-speed Ethernet backbone that enables robust security. This platform supports granular over-the-air updates of vehicle software to enhance functionality and improve performance. 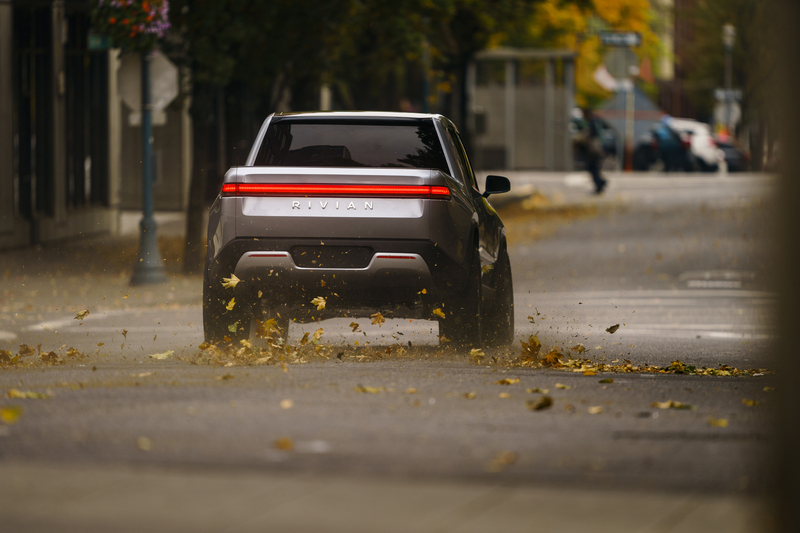 All Rivian vehicles connect to a cloud-ecosystem for data exchange and processing, enabling machine learning and data services. The digital experience extends beyond the vehicle into the cloud ecosystem and mobile/web applications and provides a consistent and seamless interface for vehicle status and control. The in-vehicle experience consists of a custom 15.6-inch center touch screen, 12.3-inch instrument cluster and a 6.8-inch rear touch screen. 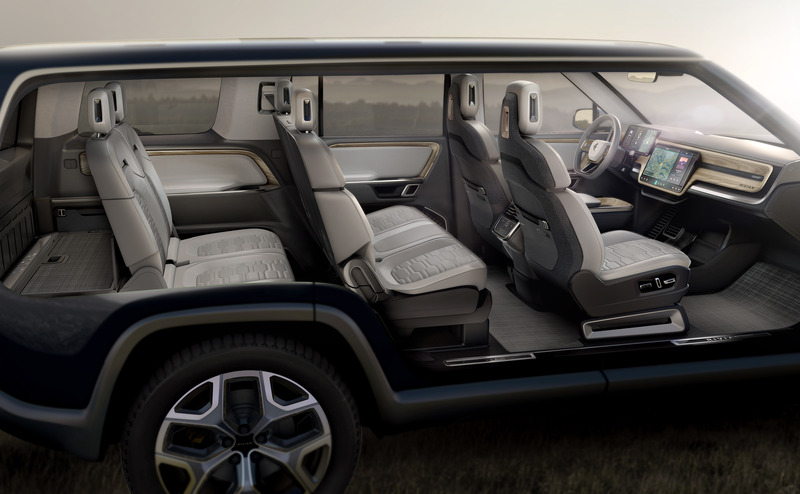 Understanding its customers desire for connected adventure, Rivian developed maps, music, navigation and other adventure-focused features to complete the digital experience. The digital user interface strongly reflects adventure, outdoors and exploration – the experience is immersive and natural whether it’s being used in a connected urban setting or well off the beaten path. The R1T will launch with a robust hardware suite with multiple modalities including camera, lidar, radar, ultrasonic and a high precision GPS coupled with high definition maps. This hardware enables “Level 3” (hands-off wheel and eyes off road) autonomy for highway operation. 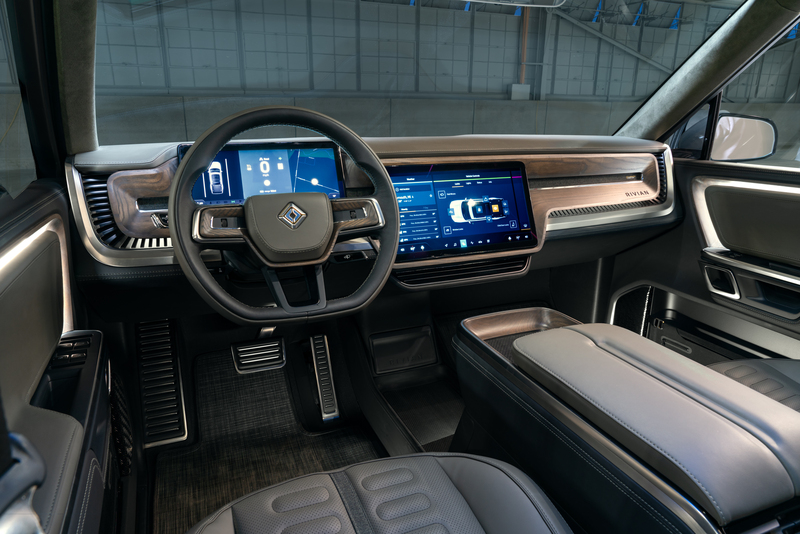 Beyond the highway Level 3, the vehicle will have a range of self-driving features focused on enabling active lifestyles. Rivian’s safety systems and body-structure design will deliver IIHS Top Safety Pick Plus and NHTSA 5-Star ratings. Safety features include 8 airbags for occupant protection and reinforcements of the skateboard platform to protect the battery. 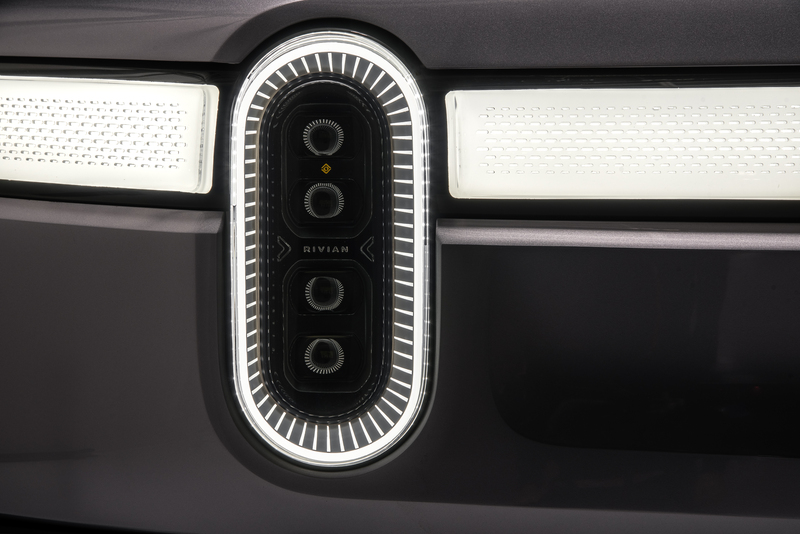 The R1T and R1S will also be offered with a full complement of active safety systems enabled by Rivian’s suite of self-driving sensors. 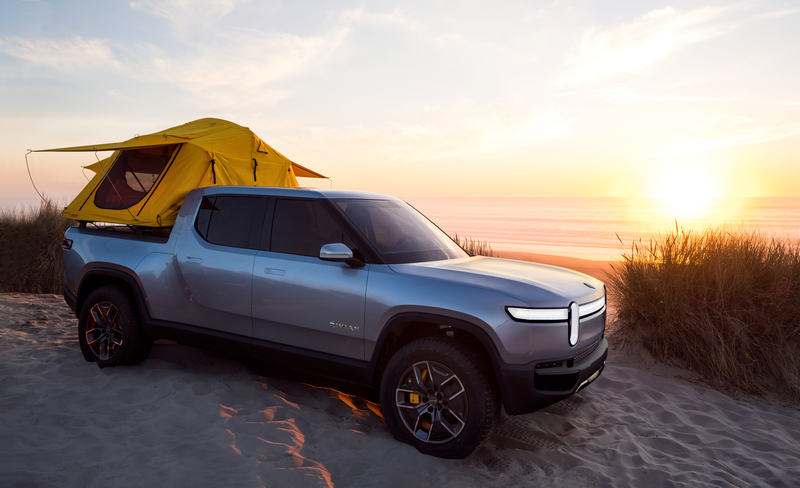 Rivian is developing vehicles, technology and services that inspire people to get out and explore the world. 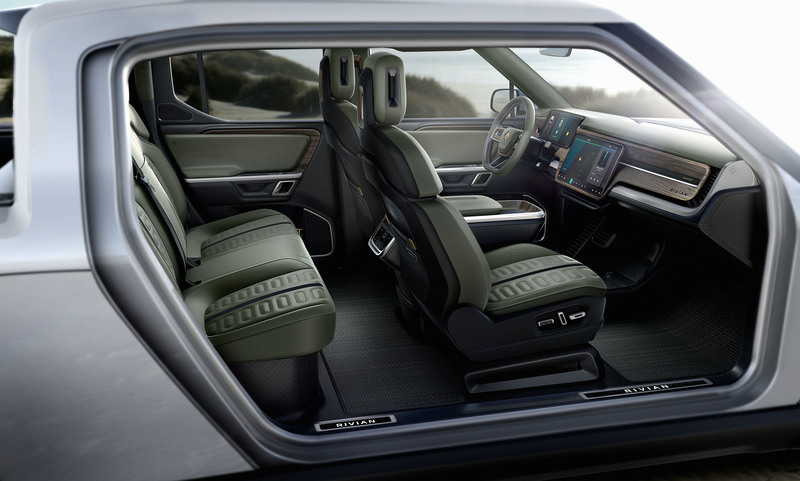 Whether it’s a family camping trip or a weekend away, Rivian is focused on providing the ultimate platform for experiencing life’s adventures. 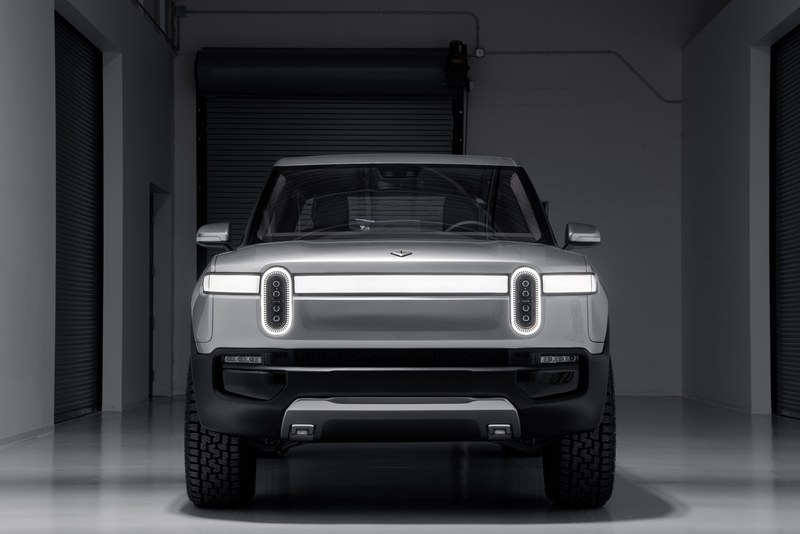 Rivian has development centers in Plymouth, MI, San Jose, CA, Irvine, CA, and the UK. The company will produce vehicles at its modern, 2.6 million square foot manufacturing plant in Normal, IL. 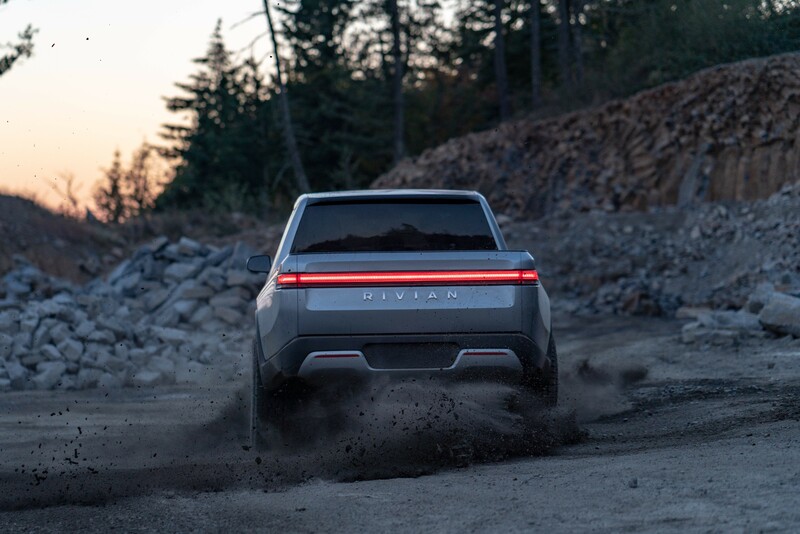 Core to delivering Rivian’s vision is a team of 600 passionate people working in close collaboration to deliver a set of products that electrify adventure. Pricing for the R1T starts at $61,500 after Federal Tax credit. Deliveries will begin in late 2020. Fully-equipped vehicles with the highest performance level and largest battery pack will enter production first. The 180 kWh pack (400+ miles range) and 135 kWh pack will be available at launch, with the base variant (250+ miles range) to follow within 12 months of the start of production.